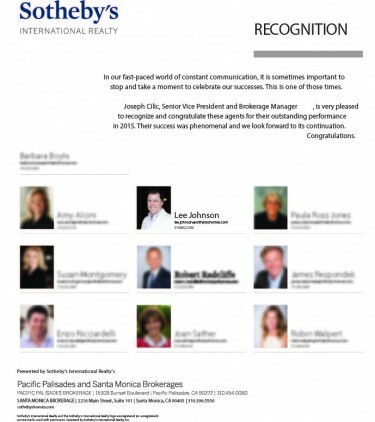 For each year Lee Johnson has been part of Sotheby’s International Realty he has been a consistent Top Producer earning recognition and acknowledgements from the Senior Vice Presidents for two years in a row! In our fast-paced world of constant communication, it is sometimes important to stop and take a moment to celebrate our successes. This is one of those times. Joseph Cilic, Senior Vice President and Brokerage Manager, is very pleased to recognize and congratulate these agents for their outstanding performance in 2015. Their success was phenomenal and we look forward to its continuation.